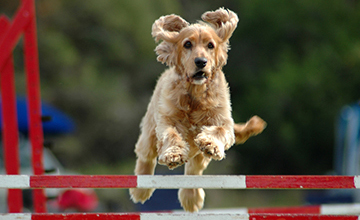 If you are competing in agility at the Excellent or Masters level (or practicing at that skill level), and you wish to continue to challenge yourself, win more if you’re competing, and grow into the best teammate possible for your dog, this is the class for you. Don’t miss this awesome opportunity to be taught by internationally recognized handler and instructor, Barb Davis. This class will focus on refining your current skills so your turns and crosses are efficient both in timing and on setting the dog’s pathway so that the dog does not lose time with extra strides and wide corners. This course will include international handling elements and progressive handling ideas to address these challenges. Many of the skills attained from developing advanced moves, gives the handler additional tools to apply to Masters courses that are continuing to grow in difficulty. The handler will also acquire skills to become capable in classes such as Premier or Master’s Challenge as well as International competition. Barb Davis will be teaching this cutting edge class. 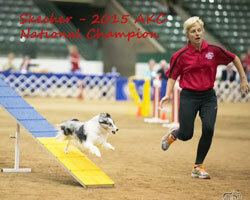 Barb is a 9 time National Champion with 5 different dogs and a 9 time AKC World Team member with 4 different dogs. She has continually competed internationally since 2000. Barb is a progressive handler and stays up to date on developments in agility around the world. Her handling style embraces moves that are somewhat natural to the dog because if the handler can learn to do it right the dog usually comprehends it quickly. Drop-ins are welcome when space is available. Please call or email to inquire. Drop-ins: $30.00 per dog (when available).